9'3"w exhibit booth is viewable from across a room. 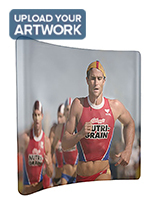 Transport case protects supplies while traveling to an event. Tube-like framing Exhibit Booth/Backdrop Setup Instructions; no other hardware needed. 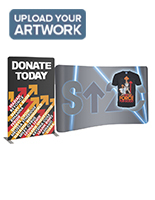 Stretchy graphic has a smooth appearance to perfectly showcase a message. 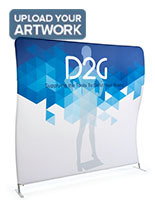 This exhibit booth is a tension banner display designed for positioning at the rear of a presentation. 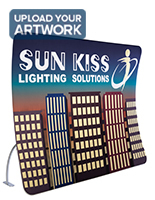 The floor-standing tradeshow fixture combines a custom-printed banner with an aluminum modular frame. Each tubular piece connects together with the snap of a button. The exhibit booth therefore does not require any additional tools to set up. 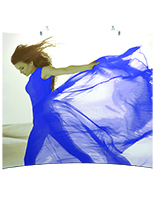 The portable trade show wall is equipped with custom graphics, printed on stretch fabric. 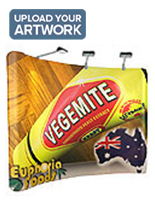 This exhibit booth, also known as banner stands, has a pillow-case design that easily slides over top of the frame. The material is pulled taut to eliminate wrinkles. 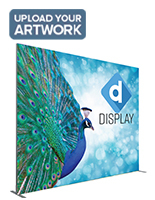 This exhibit booth goes through a dye sublimation printing process to create a 600 DPI image that is both brightly-colored and incredibly detailed. 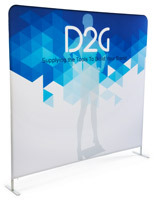 The portable trade show fixture stands just over 9 feet wide and works as an eye-catching backdrop during a convention. The exhibit booth is easy to transport in the provided shipping container. There are even built-in wheels so users can roll a case instead of struggling to carry it. 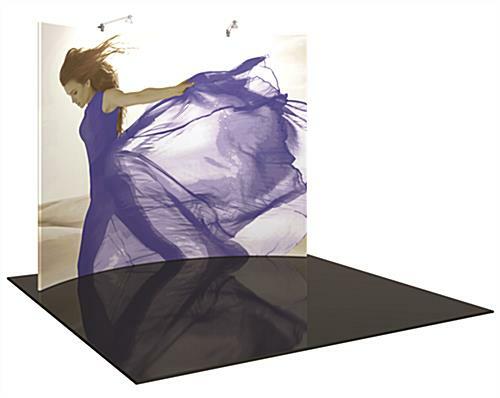 This tradeshow display has a gentle, curved design, which adds a flowing element to any demonstration. The concave fixture creates a more welcoming atmosphere without overwhelming guests or sacrificing presentational space. 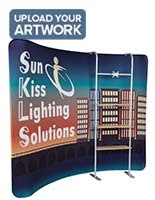 This portable trade show backwall is a great addition to any promotional campaign.